If your business isn’t growing, it’s stagnating. …and stagnating businesses don’t last very long. Soon enough, they are overtaken by competitors and cease to exist. So today, we wanted to inspire you with some amazing quotes on business growth from leading entrepreneurs. These quotes will motivate you to take your business to the next level! Even top companies can’t afford not to move forward. If Apple stopped innovating today, they’d probably be off the map within a decade, or at the very least fall off significantly. As the world changes and your industry transforms, your business must transform along with it. The changes can be small (like improving a few of your customer service techniques), or bigger, like innovating brand new products. Your growth should have a purpose, other than to just be innovative and bigger. For example, in its early years, KIND Snacks grew a little too quickly, simply for the sake of growth. According to its founder, Daniel Lubetzky, KIND “put too much emphasis on expansion and taking on big orders that were difficult to fulfill.” This stretched the company a little too thin, and he was only able to take a $24k/year salary. Had he been a little more patient, the early growth of the company could have been much smoother. Make growth a long-term strategy. Be wary of opportunities that might come back to bite you. Mark Cuban is perhaps one of the most well-known entrepreneurs, appearing on the sidelines of NBA games and on the panel of Shark Tank. With the kind of success he’s had, you’d think he’d sit back and rest on his laurels every now and then. But instead, he’s always focused on learning more, growing more, and building more. He knows that to maintain his level of success, he needs to be continuously improving both in his life and in his businesses. Mark Zuckerberg has obviously achieved tremendous success with Facebook. Perhaps one of the biggest keys to this success is his focus on growth and his ability to take smart risks. From making updates to Facebook that ruffled some feathers of users, to buying up tech companies to bolster Facebook, he’s taken big risks that have allowed Facebook to become one of the most innovative tech companies. The question is, are you taking enough risks when it comes to the growth of your business? Or are you getting a little too comfortable with its current level of success? It’s important not only to grow your business in terms of innovation, profit, customers, etc, but also to grow your team. And to understand just how valuable the people around you really are. A great team will help you accelerate business growth and create a winning (and sustainable) company culture. It’s how companies like Apple, Facebook, and Google have thrived for so long. They employ creative and innovative teams that constantly bring in fresh new ideas and perspectives. This helps keep them on the leading edge, while maintaining a healthy margin over their competition. So let every victory be their victory too. Let every problem be theirs to help solve. Let every opportunity be theirs to navigate and provide input on. 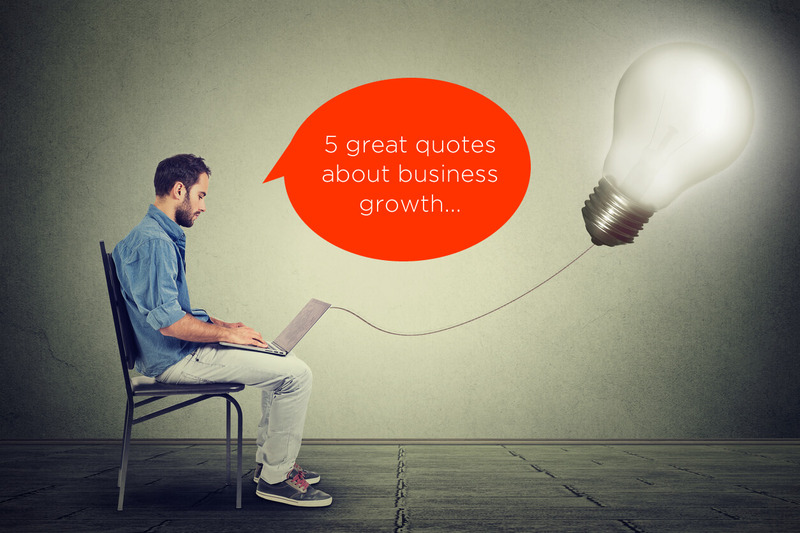 What are your favorite business growth quotes? Share in the comments!